The start of a new year is an exciting time at YIP. This year we are filled with excitement and anticipation as we open the application process for the 6th group of YIP Participants, YIP6! For those who have been involved with YIP from the beginning, its success is a sign that our initial intention, what seemed like the wildest of dreams, has become reality: YIP as an educational program continues to meet a need we perceived in the world just over 6 years ago. We are eager to welcome the next group of YIP change-makers, but first the time has come for those of us who hold YIP to evaluate the financial stability and sustainability of the program. Since YIP’s beginning, we have made an effort to keep the participation costs for the program to a minimum to ensure maximum accessibility for all young people who wish to join. Since day one, fees paid by participants (75,000 SEK per year) have been used to cover only their individual costs for housing, food, material and travel. All other costs for running YIP have been fundraised by YIP. In essence, due to the exceptional fundraising work of our organizers, we have thus far been able to provide the educational and programmatic aspects of YIP for free, and our hope is to continue to do so into the future. When we began YIP in 2008, asking each participant to pay SEK 75’000,- sufficiently covered their personal program costs listed above. However today, with a steady increase in all living costs, along with a decrease in our start-up funding, YIP finds itself having to subsidize these costs more and more. In short, the amount needed to be raised by YIP for the running of the program has become too big and too time consuming for us to hold along-side what we try to do at the core of YIP: run one of the most personal, inspiring and innovative social entrepreneur trainings offered to international young people. Therefore, to make sure participation fees actually cover costs, it has been decided that the participation fee must be raised from SEK 75’000,- to SEK 85’000,- for the YIP program starting this year in 2013. 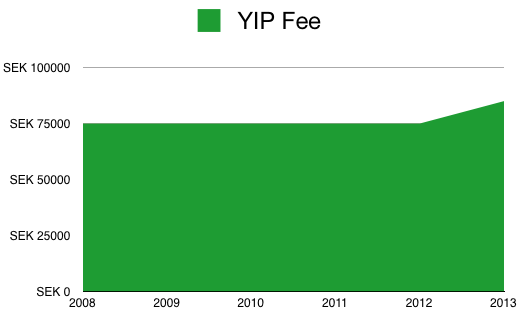 Further, following this initial increase, there will be an annual increase of 2.5% as of YIP 7. Again, the total fee of SEK 85’000,- will cover the costs for all housing, food, materials and travel for participants during the program. Participants will not pay for the educational content and staff at YIP as it is our commitment that these be fundraised to ensure the quality and affordability of the program. In order to raise the additional finances needed to cover all the other costs involved in running the program, we continue to write grants to various international foundations, and have started the YIP Friends Campaign, a new form of “crowd-sourcing” which asks for the support of smaller donations from a larger pool of people. The Friends campaign seeks to build a network of friends that commit to contribute SEK 1000,- per year to YIP, to ensure it’s existence, freedom and financial sustainability. We thank you for your understanding and support as we take this step in the direction of a financially sustainable future for the YIP program . As always, we are happy to answer any questions or concerns you might have regarding the new program costs or other aspects of the financial future of the program.